The purpose of this case study is to present the SP4CE portal use scenario, featuring various aspects of how students’ internships were organized at the Industrial Research Institute for Automation and Measurements PIAP. The Industrial Research Institute for Automation and Measurements PIAP is a scientific center running industrial research and development projects. PIAP offers internship opportunities to around 20 students annually. As a rule, PIAP interns are students of technical universities. Some internships are organized within the framework of IAESTE (The International Association for the Exchange of Students for Technical Experience http://www.iaeste.org/). These are interns from abroad; in this case, language barriers and cultural differences must be skillfully handled. Students from domestic universities are often internships in fields related to their semester or final dissertations. PIAP also cooperates with students’ scientific clubs operating at universities. Members of students’ scientific clubs are often offered internship opportunities. According to the internal regulations and local laws, student internships must be organized in a highly formalized manner. Interns are required to attend an OHS training addressing the risks and hazards that may emerge during the internship. Each inter is assigned a tutor, who has the necessary skills to supervise and monitor the course of the internship. PIAP signs a formal agreement with each intern, defining in detail the rights and obligations of each contracting party. The legal aspects are particularly important whenever interns are involved in creating intellectual property. PIAP internships are 2 weeks to 5 months long. PIAP seeks to involve interns in the day-to-day operations and activities taking place at the Institute, so that interns have the change to acquire practical skills. The SP4CE portal can be used in communication between the coach and the intern(s). This process may also involve other stakeholders engaged in the organization and monitoring of internships, such as project managers or workshop leaders. Within the system, the interns may be provided with access to OHS knowledge and resources, internal regulations of PIAP that the interns are bound to comply with, workflows and manuals, and other knowledge relevant for the internship. Moreover, the Learning Rooms functionality is where additional tasks for interns can be added. The intern tasks must be tailored to the knowledge and skills of interns and internship duration. They should be preferably practical and closely related to the current activities carried out at PIAP. Intern performance can be then evaluated in the system. Another SP4CE system functionality is to create users responsible for evaluation of tasks other than the coach or mentor, however, this task should be entrusted to competent individual(s). Evaluations of intern performance will be included in the Internship File. The system also offers internship monitoring and reporting options, which makes it much easier to compile internship reports (Internship File). Separate Learning Rooms should be set up for internship purposes. If there is any team work involved, interns who use the same Learning Room can work on the same project together. Other options – project managers or workshop leaders who are engaged in the internship and in intern activities; individuals responsible for accessing intern performance. A coach (tutor) sets up the structure of the Learning Room in collaboration with the teacher. 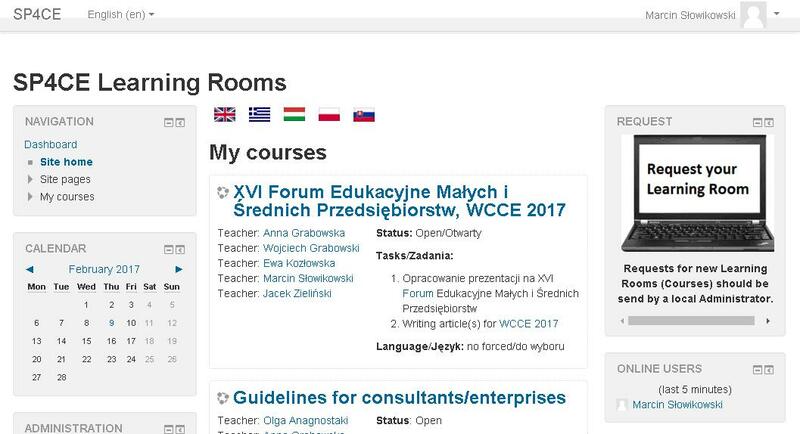 At this stage, coach and teacher discuss the existing and useful features of the Learning Room, types of activities assigned to students (Assignments, Suggestions, Chat, forum, workshop) and resources (books, files, catalogues, tags, websites) used in the Learning Room. Also, they both agree how the final performance of the students will be evaluated, and establish specific access levels. Coach (tutor) introduces the interns to the Learning Room, interns then registered in the system via e-mail or by another means, and the coach assigns access keys to the Learning Room. Students may use the available resources and other materials, communicate with the coach, teacher and other students, work on the assigned tasks and/or projects, browse or ask for new information. Coaches (tutors) and teachers may manage all tasks assigned to students. All stakeholders have the opportunity to take the best advantage of their skills and abilities to get the best final performance. Coaches and teachers can evaluate student performance. Users must first register and get an access key to access Learning Rooms. There is an online registration option, and the key can be sent via e-mail by the mentor or system administrator. No special software is needed to be able to use all Learning Rooms features, except for an internet browser at the user’s choosing (Google Chrome, Mozilla Firefox, Microsoft Edge). Solving specific problems and tasks may require special software, but the users have to be notified about it in advance. Students may use MS Office – MS Word, MS Excel, MS PowerPoint – when working on project proposals and/or reports. 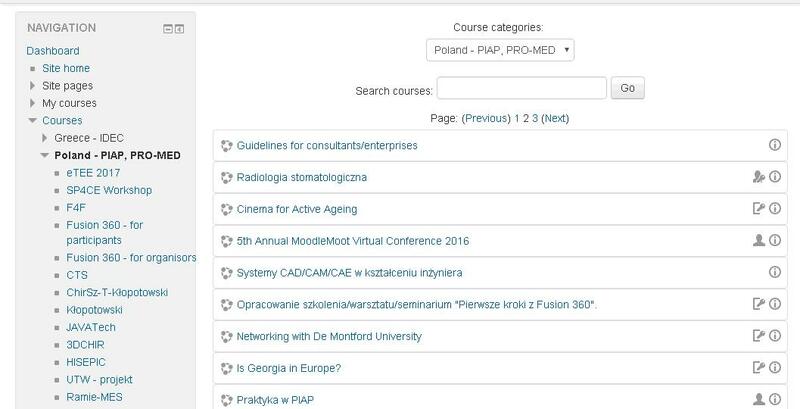 The system was used for the organization of an internship for a student of the Medical Engineering Department at the Gdańsk University of Technology. The student was also an employee of a company which delegated him/her to attend an internship at PIAP. An internship program was drafted based on an analysis of the intern profile and a discussion with the current intern’s employer; the necessary resources were allocated in the system; persons responsible were appointed in charge of making rehabilitation equipment available for internship-related purposes. Electronic resources were made assigned (refer to the print screen below). Coach and teacher design the structure of the Learning Room (Fig. 3); featuring the Internship File, background information about the accepting institution, and a dedicated section for resources that the user may need to fulfill the assigned tasks. Based on the available resources, students begin work on their solutions to specific problems and/or implementation of practical tasks – they come up with the first draft project of a solution. In the course of the internship, students may discuss tasks, ideas, and progress with the teacher, coach, and other interns. Users may use online chat, forums, and other communication methods available in the system. Students fill in the Internship File on an ongoing basis, which is reviewed by the mentor and is necessary to confirm completion of the internship. Students upload their projects and tasks to the Learning Room space. The intern performance is then evaluated by the coach and the mentor. The current system version offers all functionalities necessary to effectively support active learning. User roles are clearly distinguished. The system streamlines learning as it actively monitors the learning process. Moreover, the learning process can be extensively personalized, which is a particularly valuable feature given the wide and varied fields of knowledge covered in the course of PIAP internships. In the course of the internship, the majority of information was shared by electronic means using the SP4CE system. All parties involved had access to the system, and the internship itself was tailored to the needs of the intern, PIAP, and the delegating organization. It should be stressed that, after the internship has been completed, PIAP continued cooperation with the intern and the employer delegated the intern to perform other tasks. There are risks associated with the assignment of tasks to the intern. More specifically, this may raise some concern if the intern’s background knowledge and his/her expectations require access to resources that PIAP is unable or unauthorized to share. Conclusively, it should be emphasized that PIAP resources and the feasibility of internships as such are firmly linked with scope of activities conducted by PIAP for external and internal recipients. Students should not be assigned too complex / unclear tasks to solve, especially at the beginning of the internship, before the coach learns the intern better. In this manner, students are not given any tasks which are not within their field of competence. Also, the coach should keep in touch with the mentor who has a more in-depth knowledge about the student’s capabilities. On the other hand, a student may feel discouraged or overwhelmed by tasks which he/she finds too difficult. It is also often the case that students find it difficult to begin working on the task, and the coach should actively motivate students and offer them full support, especially in the beginning, for example by presenting examples of solutions to similar problems.